Regionalization in general and regional integration in particular have taken place at a growing pace since the end of the Cold War, when states were set free from various security overlays. Regional integration is ’logical’ as it is supposed to advance wealth and peace. Still, the picture is far from clear and the process of regional integration is not automatic; disintegration takes place, as we saw in the cases of the Soviet Union, Yugoslavia and Czechoslovakia to mention a few. This is the case not only in states recently brought together but also in traditional states like Britain, The Netherlands and Spain where strong groups strive for independence. In some places regionalization is flourishing, but regional integration is not. Some regional integration projects like the North American Free Trade Agreement and Mercosur seem to stagnate. Certainly there are limits to regional integration. This comprehensive volume, written by high profiled academics, covers these themes by examining eleven cases ranging from the lack of integration in the Arctic and the Middle East, to ongoing or progressing integration in Europe to uncover what ’blocks’ regional integration, the results of which are used for developing new theoretical insights. SÃ¸ren Dosenrode is a Professor of International Politics, Jean Monnet Professor of European Studies, and Director of the Centre for Comparative Integration Studies at Aalborg University. He holds an MPhil from the University of Copenhagen, and a DPhil from the University of ZÃ¼rich. 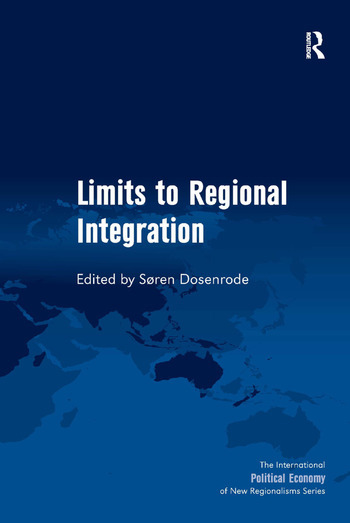 SÃ¸ren currently heads a research project on indicators for potential regional integration. His latest Ashgate publication was The European Union after Lisbon: Polity, Politics, Policy.